I finally watched all of Game of Thrones, the George RR Martin fantasy series from HBO (which got an Emmy nomination for Best Drama yesterday). The series followed the book extremely closely so not much of the plot came as a surprise but I still enjoyed it quite a lot. The interiors for Thrones were filmed at studios in Belfast's docklands and the exteriors were shot in Northern Ireland (a second unit shot in Malta). In the first episode a major scene (the execution of the deserter from the Wall) occurs in a place where I used to go camping when I was kid. That was strange: George RR Martin's exotic world of Westeros is in fact just outside of Larne on the A2. Probably no weirder than the residents of Vancouver discovering that the planet Caprica from Battlestar Galactica was in fact the University of British Columbia. In the book I disliked the entire Lannister clan (they were the villains after all) but on HBO they were much more fun and entertaining than Sean Bean and his worthy clan of the north. 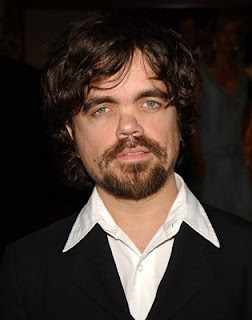 The star of the Lannisters of course was Peter Dinklage who has just been nominated for an Emmy as best supporting actor in a drama. I've loved Peter Dinklage since I saw him in the wonderful indie comedy, The Station Agent. He also had a memorable turn on 30 Rock back when that show used to be funny. His accent on Game of Thrones is a bit dodgy but his natural charisma, comic timing and intelligence carries him through and if there's any justice, he and Ed O'Neill will win Emmys this year.